New Delhi: The government, under pressure from a united Opposition as well as an aggressive farm lobby, finally blinked and rolled back contentious rules it had effected on sugar cane pricing, clearing the decks for the crushing season to resume in earnest in Uttar Pradesh (UP). While this is a setback for the Congress-led United Progressive Alliance (UPA), it allowed the Opposition to score vital political brownie points. At the same time, the resumption of crushing will ease the supply situation and reduce pressure on the government to seek sugar imports. The three-week-long protests by farmers from UP, which produces almost half the country’s sugar cane, had hampered crushing. The Opposition stalled the first two days of the winter session of Parliament over the issue. This deadlock ended after the government agreed to make changes in the sugar pricing ordinance, though experts aver that the underlying issue on pricing is yet to be resolved. The farmers are yet to formally call off the agitation. A statement issued by parliamentary affairs minister P.K. Bansal after an all-party meeting on Friday said, “It is proposed to delete the clause. Consequently, if the state announces an SAP (state-assured price for sugar cane), it will be the responsibility of the sugar mills to pay the SAP to the farmers." Crushing can now start, said Vinay Kumar, managing director of the National Federation of Cooperative Sugar Factories Ltd.
“The delay of almost six weeks has tightened supplies further. Everyone was depending on UP mills to start on time to tide over the situation," said Yatin Wadhwana, head of Sucden India. India, the world’s top consumer and the biggest producer behind Brazil, has placed an import order of a record five million tonnes of raws, pushing New York-traded raw sugar to 28-and-a-half-year highs. A massive demonstration by farmers in the Capital on the first day of the winter session on Thursday raised the profile of the agitation, especially after political parties turned up in support. Congress general secretary Rahul Gandhi met Prime Minister Manmohan Singh on Thursday to seek “pro-farmer" changes in the ordinance. After the adjournment of both houses of Parliament for two consecutive days, the government advanced an all-party meet convened for Monday and announced the decision to amend the ordinance. 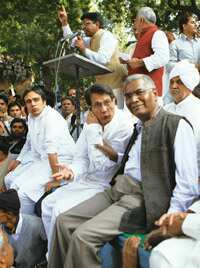 The UPA allies held a separate meeting before the all-party meet. A Bill to replace the ordinance will be introduced in the Lok Sabha on Monday and will contain the revised provisions, said minister of state for parliamentary affairs V. Narayanswamy. “In view of certain judgements of the Supreme Court, it was necessary to determine the price of levy sugar and to validate the actions taken by the Centre in the past," Bansal said, underlining the need for the Sugarcane Bill. The Opposition said it will ensure speedy passage of the Bill. “No single party or individual could be given credit as it goes to the farmers. This is a victory of the farmers’ rights and strengthens the democratic process," said Sushma Swaraj, deputy leader of the Bharatiya Janata Party in the Lok Sabha. Gandhi’s intervention has been cited by the media as being key in persuading the government to change its mind. The farmers’ agitation is only “partly over", according to its leaders. “We have not called off our agitation, the struggle would now shift from Delhi to Lucknow. The damage that could have been made by the ordinance has been averted, but we still want a higher price for the farmers’ sugar cane produce," said Rashtriya Lok Dal chief and member of Parliament Ajit Singh. The government had fixed the purchase price at Rs129.84 a quintal for the current season. Farmers in UP are demanding a rate of Rs280 a quintal, while sugar mills in the state have agreed to pay Rs180-185. Sudhir Panwar, a professor at Lucknow University and president of the Kisan Jagriti Manch, said, “The government’s decision will give limited relief to the farmers. The new FRP of Rs129.84 per quintal declared by the Centre, which replaced the earlier statutory minimum price (SMP), is neither fair nor remunerative as it is much less than the market price of sugar cane, which is Rs172-230. So, either the government should hike the FRP or should go back to the earlier SMP because state governments will have no authority to hike the price above FRP. The new provision also could be spiked by the judiciary, if challenged." Sugar stocks showed mixed reactions on the Bombay Stock Exchange (BSE), with Shree Renuka Sugars Ltd rising 1.61% to end at ₹ 30.25, while Balrampur Chini Mills Ltd fell 3.18% to close at ₹ 34.05. EID Parry (India) Ltd fell 1.56% to finish the day at ₹ 315.20. BSE’s benchmark index, the Sensex, rose 236.20 points, or 1.4%, to end at 17,021.85 on Friday. The National Stock Exchange sugar sector index gained 10.05 points, or 0.3%, to close at 3,333.02. Asit Ranjan Mishra and Shauvik Ghosh of Mint, Reuters and PTI contributed to this story.